The Queen's Bath is one of Princeville's favorite summertime attractions. A pleasant 10 minute hike past a waterfall leads down to a rocky landscape of lava rock. Another 5 minute trek over uneven rocks leads to the bath. 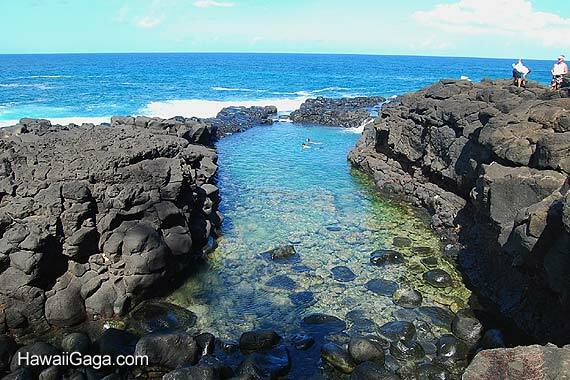 Roughly the size of a large swimming pool, the Queen's Bath is a natural tide pool with some fish. Water spills over the lava rocks to refresh the pool. Although the scenery and bath are a pleasant excursion for capable hikers, like many ocean attractions on Kauai the area should be approached with caution. Visiting the Queen's Bath without appreciating the potential hazards can be deadly. The hike is not suitable for all. Please read the following guide before you decide to visit. The recommendations below are based on our experience from living near the bath. From October through May the coast here is exposed to very big surf. People have drowned after being swept off the rocks. The path and rocks are not suitable for those with mobility problems and entering and exiting the pool requires agility. Severely sprained ankles and bruises and cuts from slips on wet or uneven rocks and dirt are a common occurence. After rain, the path becomes very difficult to walk. Many are confused about the location of the tide pool - there are other areas where it is also possible (but more dangerous) to swim. 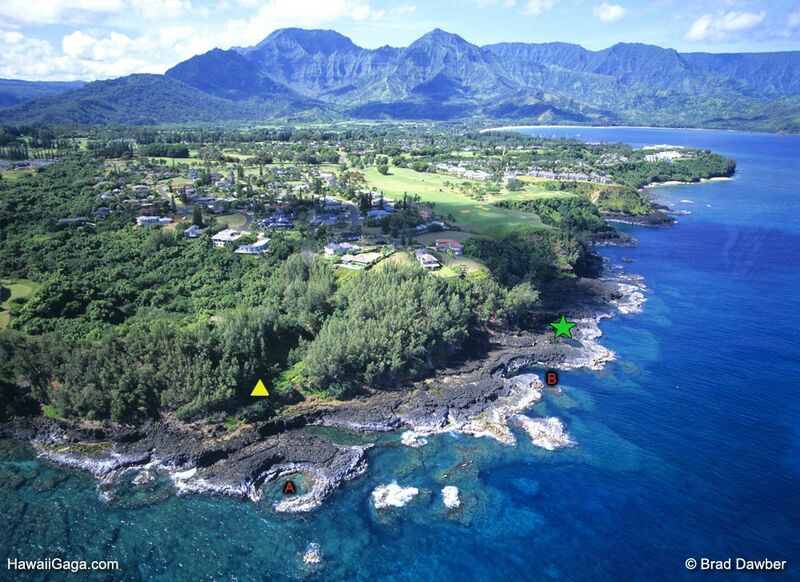 In the aerial photo above, the yellow triangle shows where the path emerges from the trees. The green star shows the location of the pool. A - Sometimes confused for the QB. This area is exposed to open ocean and difficult to reach. It's never safe to swim here. B - This inlet, located just before the bath, is a popular spot for locals who like to jump off the 15ft ledge. As alluring as it looks, don't be tempted to swim here. The inlet is subject to massive turbulence and exiting can be difficult. It's important to check the surf report before you visit the ocean on Kauai so that you know what size waves are possible. Simply watching the sea for 20 minutes before you approach is not good enough! The biggest waves of the day, as predicted by the surf report, could arrive at any time without warning. Ask yourself, "can this activity be done safely if those waves arrive?" Check the surf report the morning you want to visit. The Queen's Bath is safe to swim in when waves are 4ft high or less. If the surf report predicts waves bigger than 4ft, don't visit at all, even to look at surf. Never play on the rocks between the bath and the ocean. Don't jump into the pool. The depth can fluctuate from day to day. Only swim in the pool, not the ocean. In the winter months the odds of the ocean co-operating are slim, but there are calm days. Conditions in the summer are much better but always check the surf report first. The biggest danger at the Queen's Bath is getting pulled into the ocean while watching big surf. Much of the lava shelf is 10 - 15ft above sea level, and there are areas that are higher. This leads to a false sense of security. Compounding the problem are people approaching the ocean blind (not knowing the surf forecast). Between 1970 and 2012 there have been seven drownings. The death toll sign at the bottom of the path indicating 25+ deaths is an exaggeration, but a necessary alarm. We advise against visiting the Queen's Bath when the surf is over 4ft because it's impossible for you to judge or understand the risks as the surf picks up. Surf 4ft or less provides the necessary safety margins. In 6-8ft surf there could be long periods where the Bath and ocean appear to be safe and you'll undoubtaly be tempted to swim or approach the ocean at sea level. As a tourist, it's not possible to safely watch big surf from the Queen's Bath! The best place for watching big waves is the Kilauea Lighthouse, or the St. Regis Hotel. The following video shows what the area looks like in 4-6ft vs 12-15ft surf (different days in March).